Offer valid only when paying with a stored credit card in the RideYellow app in South Bay area. Promotions cannot be combined. * (Area bounded by Alameda St., Santa Monica Fwy., Harbor Fwy., and Caesar Chavez Ave., Plus Union Station and Chinatown). For Superior Taxi Service in the South Bay Area! Call United Checker Cab. 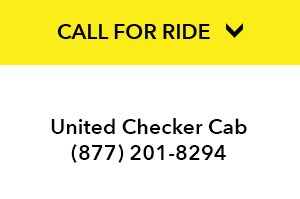 United Checker Cab offers service to Los Angeles International Airport, John Wayne Airport, Long Beach Airport and Burbank Airport. Use our taxicabs for non-stop service to the airport, and avoid having to stop along the way or share your ride with strangers. Non-emergency Medical Visits , Dialysis Treatments, Outpatient Surgeries and Hospital Checkouts. Wheelchair accessible vans are available. We pride ourselves on SAFETY. A dispatching system that has real time access to emergency services in the LA County. All of our Vehicles undergo scrutinous safety, city regulated, and maintenance checks. A driver with a valid Taxi License, which guarantees a clean criminal, drug and driving record. Peace of mind that you are in good hands! Full Size Taxi Cabs, Vans, Mini-Vans, Sedans and Paratransit Vehicles available.